This heartwarming story of 86-year-old retiree proves that age is just a number and it’s not too late to take on a new hobby. 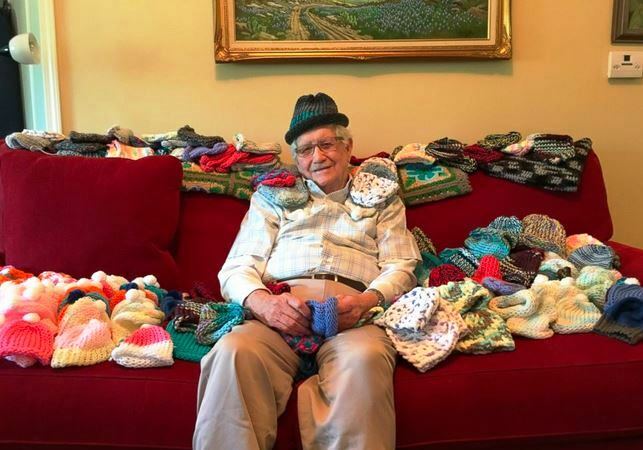 Ed Moseley taught himself how to knit to make little knitted hats for premature babies. When staff members at the Dogwood Forest Assisted Living asked residents to help Atlanta Hospital by making woolly hats for premature babies, the retired engineer knew he wanted to get involved. Ed was battling cancer, but there was something else hindering him from helping – he didn’t know how to knit. So Ed reached out to his daughter and she surprised him with a looming kit. “I told my daughter about it and I said, ‘How can I knit? what do I need to do?’,” Ed told the Atlanta Journal-Constitution. “Bless her heart, she went … and got a [starter loom] kit, yarn and instruction kit for me. So I started slowly and learned it just takes patience,” he said. But he picked up the skill quickly, and soon set about on his tiny cap project. “I could watch TV at the same time and knit,” he gushed to InsideEdition.com. While it took him hours for his first creation, Ed was determined to make a success out of his project. And soon enough, he had already managed to make 55 caps and recruited fellow residents to join and taught them how to make hats. Eventually, Ed and his fellow Dogwood Forest Assisted Living residents made more than 300 hats beating their original 150 cap donation target. Ed’s hats were delivered to the neonatal intensive care unit at Atlanta’s Northside Hospital – just in time for National Preemie Awareness Day. The hospital delivers more babies than any other hospital in the US – including some 2,000 premature babies per year, reported Independent. “The fact this man is taking time out of his day to help the kids really means a lot to us,” he added. The octogenarian has now started making hats for his friends and family.